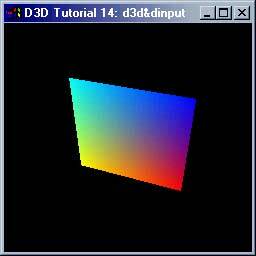 This sample is only for DirectX beginners. It shows how to make a 2d map out of an int map. This sample is a "pure" Hack, so don't expect any oop in there. Tut13 shows how to make a 3d map out of two int arrays(tex & height). This sample is an great improved Tutorial 12 sample. 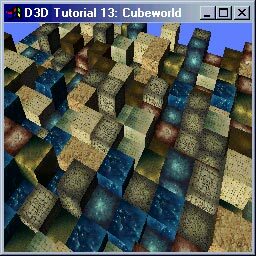 Here is a much improved sourcecode of cubeworld. Joachim Hofer from www.crowsoft.de has optimised it for speed reasons and deleted unnecessary code (with very good comments). Additonal features: Backbuffer resolution correction on windowresize. It shows how to use Dinput in DX8. It should be used in combination with the DirectInput Tutorial. The whole source code is taken 1:1 from the D3D Tutorial 3: Using Matrices plus the source code of the sample function of the DirectInput Tutorial. I don't like the sourecode of microsoft much cause its a bit hard to read. 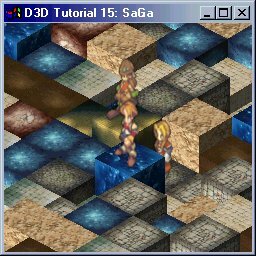 The Square can be rotated by pressing the left or right arrow. Simon O'Connor from www.creative-asylum.com helped me alot - thx. This sample features billboarding,orthogonal projection and has a 3rd int array for characters. It shows how to sort(bubblesort) the characters, cause there is this anti aliasing problem when transparet textures overlay each other and aren't rendered in the correct order. If anyone has an idea how to improve the samples please mail me here.